A few weeks ago I spotted the very first Plant City Florida strawberries in my local grocery store. I almost did a happy dance right there in the produce isle. I just get so excited every year when strawberry season rolls around. Florida may be known for their outstanding citrus, but to me it’s the Florida strawberry that should get all the attention. We have a huge strawberry festival every year in Plant City. It’s so much fun, we’ve been several times and can’t wait to go again this year. It starts this year on Feb 26, and it’s a week long event packed full of all sorts of fun and entertainment. We also like to go to local u-pick farms and get the ripest strawberries. They always taste even better freshly picked. We can’t go too often though because I have absolutely no self control and will eat so many berries I get sick, every time. You’d think I would eventually learn, but I never do. Eating fresh, local fruit and vegetables is even more important to me now that I’m pregnant. And while it’s easy to eat my weight in my favorites like strawberries, I still struggle to get in all my servings of vegetables. But I really have no excuse because it’s so easy to find local fresh vegetables at our grocery stores, farmer’s markets and at restaurants. It’s so easy to eat fresh, local fruits and vegetables here in Florida because we have so many things available year round. Our mild Florida temperatures means we have fresh fruits and vegetables all year long. Eating these fresh, seasonal items means foods are fresher and tastier, and the nutritional value is optimized. It encourages a diverse diet that is often more economical and harmonizes with nature’s production cycle. 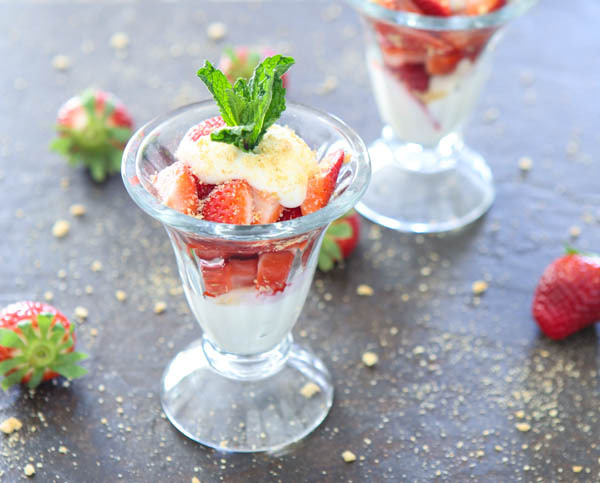 For this recipe I used fresh Florida strawberries and fresh mint from my garden. I found local Florida Strawberries on sale today at amazing at the grocery store. They were so ripe and beautiful, I just couldn’t pass them up. 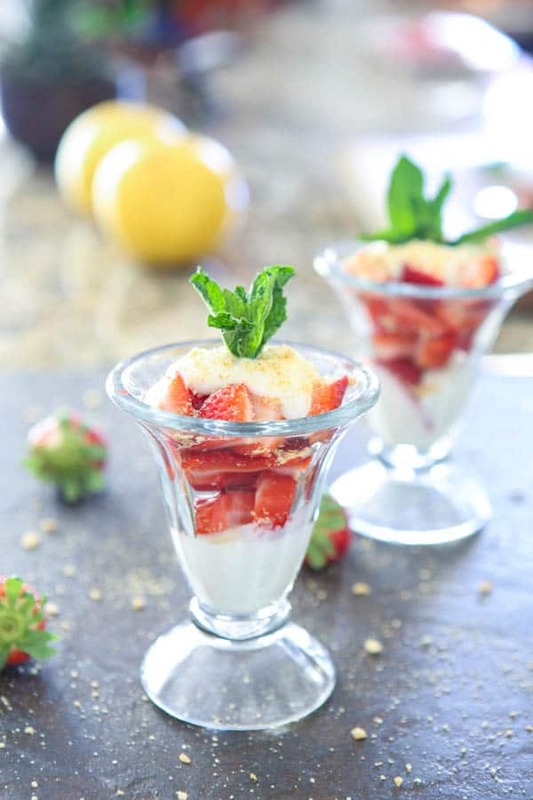 After I got home I found this great recipe for a Florida Strawberry Parfait on the Fresh From Florida site. 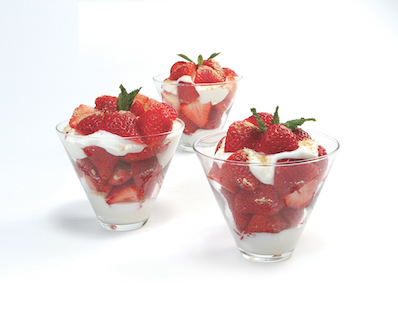 These parfaits make the perfect breakfast, afternoon snack, or after dinner dessert. You can head over to the Fresh From Florida site and view some amazing recipes that utilize fresh seasonal Florida produce and seafood. 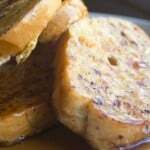 Be sure to check back often because they update the site with seasonal recipes. Or, next time you are dining out or shopping for groceries, look for the Fresh From Florida logo to make sure that your food selections are fresh, healthy and support your local community. Be sure to connect with Fresh From Florida on Facebook and Fresh From Florida on Twitter too! In a medium-sized mixing bowl, combine whipped cream cheese, sugar and lemon juice. Fold the yogurt into the cream cheese mixture. 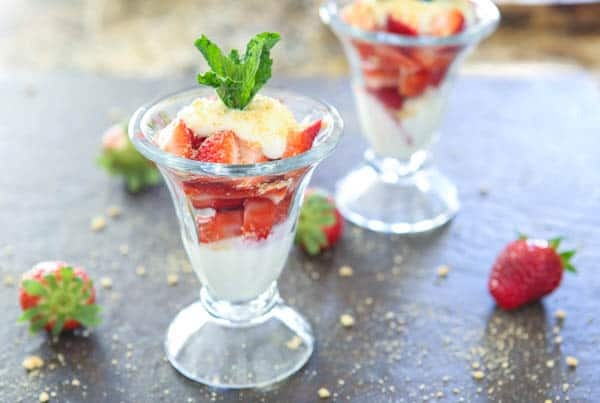 In four wide-mouth glasses, evenly layer cream cheese mixture, strawberries and crushed graham crackers. Garnish with sprigs of fresh mint. Serve chilled. I get really excited for the arrival of strawberry season too, but we still have a month or two to wait for the good ones! This parfait is something I’d happily eat for dessert any night of the week. Our strawberry season is coming up. I will have to try this. Ohhh love a good parfait!!! Yay for Florida Strawberry season!!! As a New Englander (with way too much snow this winter) I’m always very appreciative of warm weather produce producers – we’d be lost without them supplying the Northeast in the winter! Love this parfait! These look amazing and refreshing! Strawberries make me feel like summer is coming at any moment….even if it’s snowing outside. Like today. I’m so jealous of your delicious Florida fresh vegetables. It’s so cold here in NY that I would do just about anything for some fresh strawberries. This parfait looks so easy and delicious. These are delightful little parfsits. Love the year round freshness you have living in Florida. Lucky! So excited for Strawberry Season!